Members of 2 PPCLI on patrol in Kapyong, sometime before the battle, April 1951. In late April 1951, the retreating Chinese and North Korean forces regrouped and counter-attacked in the western and west-central sectors of the front. 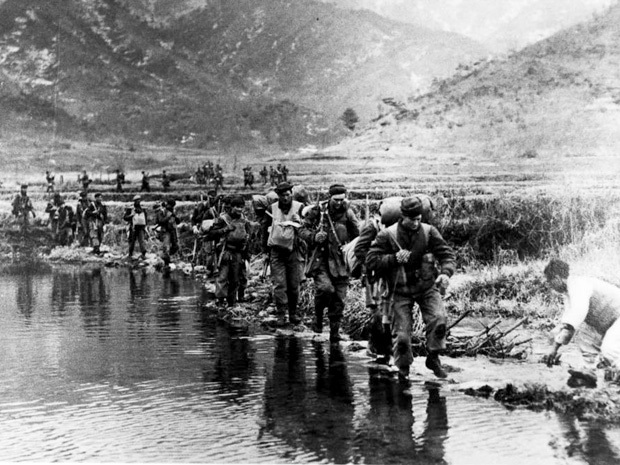 The South Korean forces in one area were overwhelmed and hurriedly fell back, putting them in danger of being overrun and wiped out. The 27th British Commonwealth Infantry Brigade—along with its Canadian contingent— was called up from reserve to the Kapyong Valley to cover this desperate retreat. In the end 700 Canadian soldiers defeated 5,000 enemy troops in the battle of Kapyong. Colonel G.P. Howell (left), Commandant, U.S. Army Parachute School, presenting American “Jump Wings” to Captain C.F. Hyndman, Medical Officer, 1st Canadian Parachute Battalion, Fort Benning, Georgia, United States, 12 September 1942.